I wake knowing that I’ve been lucid dreaming. As a result, I have an expanded awareness about Apu Ausangate’s summons. Repositories of information, mountains are expressions of energy that act as generators to amplify the quality of energy they hold. 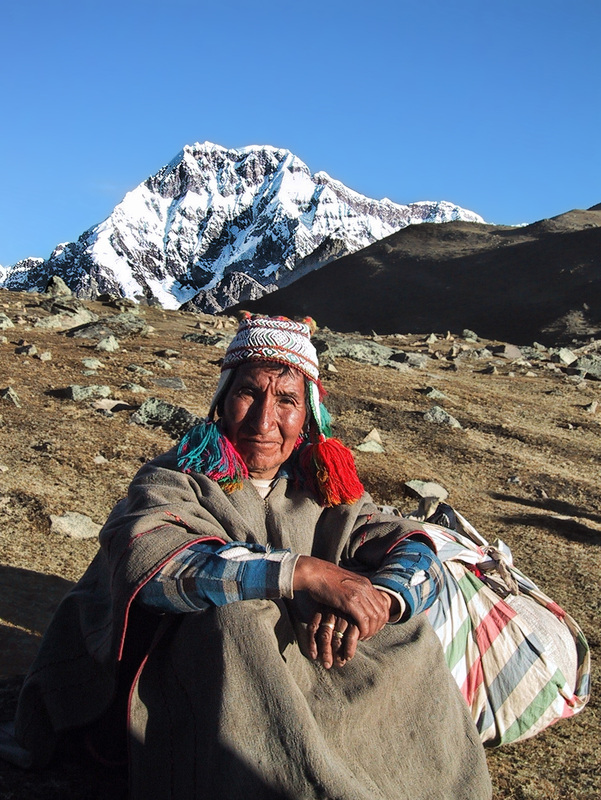 Considered the most sacred holy mountain that holds a “masculine” frequency of energy, will Ausangate accelerate the possibility for me to create the structures needed in my life to restore ayni or wholeness and well-being? This, I feel certain, involves the melding of the masculine (form and structure) and feminine (pure potentiality; unbounded fertility) qualities of my nature. My body tingles, but fear also rises. Am I genuinely committed to my soul’s evolution — to absolutely meet this challenge? I have spent the past two-years learning to impersonally unknot threads of my attachments, by recapitulating memories and family-held stories to “see” the essential organizing principles that separate me from my soul, as well as connect me to the matrix of life. Through this process I have consciously worked to refine affinities that hold me back from experiencing my essential nature — my divinity — and keep me from living life fully. Do I have the courage to be a luminous warrior? I don’t honestly know. But, in my uncertainty, I know that that is the only question of any real meaning to me anymore. I am filled with appreciation and gratitude for all my life experiences that have brought me to this point. 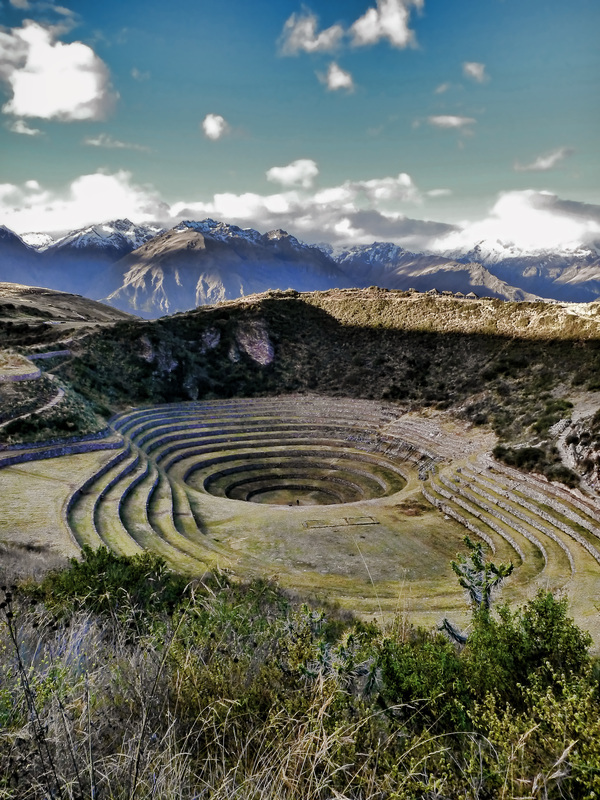 After the workers leave for the day, I and the other women of our group walk single-file down into the center of the Temple of the Feminine (Moray Circles) to hold ceremony to reclaim our quintessential feminine nature. There is no script. The ceremony organically grows out of our availability to experience. We are told to bring a flashlight and warm clothes because the temperature will drop dramatically when the sun sets. By the time we reach the innermost circle many of us are wearing our jackets, gloves and hats. 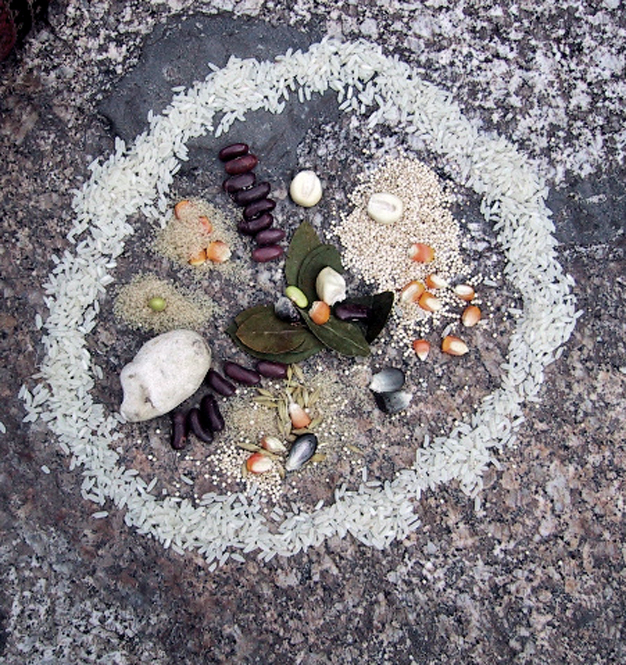 Arranging ourselves in a circle, Karina spreads a mestana cloth filled with coca leaves in the center, and invites us to make a k’intu (offering) that will carry our prayers to Pachamama (Mother Earth). Once done, we partially bury these so they are standing in a circle within our circle. Doña Berna tells us a story about her youth and her connection to the feminine, which Karina translates. Then Doña Bernadina shares the story of her life. Soon others in our group begin to share. One by one the threads of our connection to the feminine are revealed. I, too, share my story. My thread contains sorrow, gratefulness and joy — sorrow for loosing my mother while still a baby and the distance I created with my mother who raised me, gratefulness for the nurturing I received as a child and later coming into adulthood from my mother-in-law, and the joy I feel in my heart for re-membering my connection to Pachamama, our Eternal Mother, who never left me and always nurtures and sustains me. The shared stories bring up sadness, pain, regret, loss — woundedness — while also celebrating the wonders and miracle of the feminine. Tears are shed. Laughter is shared. Our threads woven together begin to form an exquisite, sacred tapestry. After several hundred yards walking along the railroad track beside the Urubamba River, we come to a massive, flat topped boulder lying partially on the shore and partly in the river. Carefully, we work our way down the steep embankment and up onto the boulder. It is here we will create a sand-painting that depicts our life’s journey, share it with another, and cast the elements into the Urubamba to be cleansed and released to Spirit. Jerry and I look across at each other — we began this journey together and equally feel the appropriateness of doing this culminating piece of sacred work together. This final task is perfect. For almost three-years, I have relentlessly tracked and examined my life through the lens of a mythic journey. My purpose has been to “see” the deeper symbolic meaning of my relationships and experiences, including leukemia, and to heal at all levels. Where has my life been leading me? For what have I been searching? How have obstacles presented themselves along my path? Who or what has influenced and supported my search? What gifts have I acquired along the way? Jerry knows much of my life’s journey from previous work done together and immediately gets the story told in my sand-painting. I do not even try to bring into words the many possible implications of my revelations. Scooping all of the elements up into my hands, Jerry and I walk over to the edge of the boulder. With a prayer of thanks for all the lessons, challenges and opportunities, and support given me to evolve, I cast them in the water to be purified and transformed as they make their 6,000 mile journey to the Amazon River and out to sea.